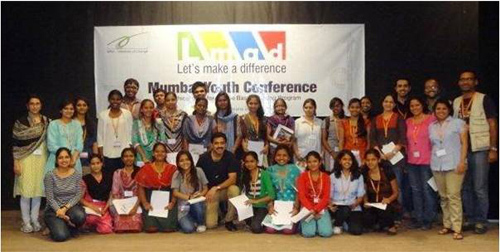 I always wanted to do a Let’s Make A Difference (Lmad) programme in Gujarat and Bhavnagar created an opportunity. The program was my small token gesture towards my janma bhoomi. I moved to Mumbai, which became my Gyan bhoomi and Karma bhoomi. Doing a programme in Mumbai was special and will always remain so as the city has given with both her hands to every person who comes to take refuge under her and I am one of them blessed by her. I used to think that the freedom, security, condition and availability of resources for women in Mumbai are far better than any other city, town or village across the country. I was mistaken and when I interacted with the participants and heard them share from the dais it gave me a complete different scenario. Mumbai is the financial hub of the country, people talk in lakhs and crores. Stock market, Bollywood, Multi National Corporations, giant corporates, and in the midst of all this, the ordinary middle class is completely lost, struggling to make two ends meet. This made me realise the immense value of the money they paid as the conference fees. The participants were thinking that the college must be getting some kind of commission out of this Lmad training programme. Their perception changed at the end of the programme but this made me think deeply of the challenges faced by an ordinary middle class family in the city. Our so called television serials produced in Mumbai only show glamour and even the smallest character artist talks of crores of rupees and nothing less than that. The actual reality is that a young lady in her teens finds it difficult to have a small amount of money as fees to learn the real lessons of life which will build her foundation by subscribing to ethical and moral based teaching. The struggle doesn’t end here she still has to face her family and relatives and constantly live under the pressure of quitting college and getting married. It doesn’t matter if she is good in studies, what the parents want is getting her married before she starts asking questions. Cinema halls, jeans, t-shirts, trousers, talking to young man are a distant dream and strictly prohibited. Girls are enforced never to think or look in that direction. For many of us, these issues are non-issues. But for many of the girls, it is a constant struggle and a vital part of her life is pre-occupied in achieving the un-achievable. The most liberal and safest city for women in India is Mumbai. Over here she faces such conditions and challenges, one can only imagine the state and plight of women across India. After attending outreach programs in Bhavnagar, Nagpur, Jamshedpur, Ranchi, Baramati, the Mumbai city youth felt the urge and inner calling to have this program in their own city as well. In Mumbai the pace of life is very fast. Very often, a person falls into a rut and does not question the flow of life. In order to break this flow and take control of one’s own life, a conference like this is of extreme importance. The objective of the conference was to fortify moral values and build character. 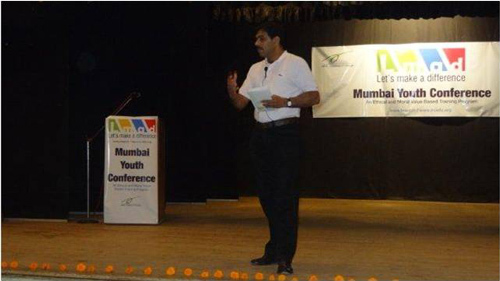 On the morning of 26 January 2013, 328 participants were warmly welcomed to the inauguration of Mumbai Youth Conference at S.N.D.T. 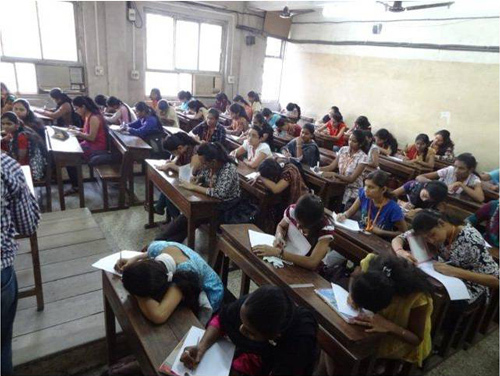 College in Ghatkopar. Following the lighting of the inaugural lamp by the dignitaries, Youth Representative of ‘Let’s Make A Difference’, (Lmad), Dipti Rane, spoke about her journey with Lmad and how her association has helped her become a better person. She shared about how short tempered she was and how her outlet of anger was always her mother. Her anger led to several broken relations in her life. Coming to Lmad, she realised her mistakes and took corrective steps to gain control over her anger. She also shared about the importance of a woman as a mother, sister, daughter, daughter - in - law and a wife the society today. As the child bearing member of the family, a woman plays a vital role in building a strong morally equipped society. Speaker for the Inauguration, respected paediatrician, Dr. R. K. Anand, addresses the youth with Mrs. Kusum Dharamshri seated on the dais. Smt. Kusum Dharamshri (Principal of the College) expressed love and care toward her students. She shared about her journey and hard work towards organising the Conference for students of her College. She stressed on the importance of subscribing to the absolute standards of LMAD and abiding by them in our day to day lives. She appealed to the students to completely surrender themselves to the teaching of LMAD for the next four days in order to experience the impact of a life changing experience. The Conference progressed with the participants being introduced to the four absolute values of IofC: Purity, Honesty, Love and Unselfishness. Mr. Viral Mazumdar, the course convener, shared his personal encounters with these four absolutes. The participants could relate the examples shared to their daily experiences in their lives. The four absolute values of Purity, Honesty, Unselfishness and Love are the guides that help every individual become a better person. They are a standard against which, we measure our lives in our Quiet Time. If each person decides to live on the basis of the four absolutes, the larger goal of a better life is achieved. The participants then dispersed into their respective groups where they reflected upon these values: purity of speech and thoughts, dishonesty to parents and in situations where it was the easy way out, jealousy when a fellow class mate or co worker excels more than them, love toward relatives and friends only conditionally and for personal gains. Mr. 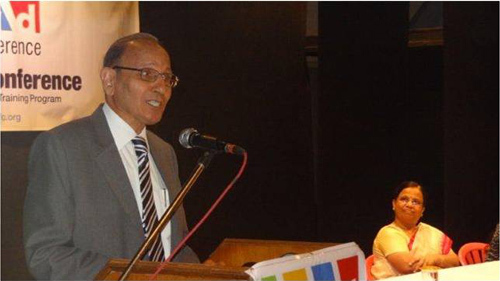 Viral Mazumdar, enriched the girls from S.N.D.T. College by sharing his personal experiences with the four absolute values of Purity, Honesty, Unselfishness and Love. A young girl shared how her father had been sick for the past few months. She had a fight with her father and because of her ego, she was unable to even approach him and ask him how he was keeping. She admitted that she was feeling bad. She resolved to go home and spend some time with her father. When we dress up in the morning, we look good from outside. But it is also important to introspect and awaken the inner conscience. Because what the inner voice speaks is pure, true and free of any conditions. The participants were then introduced to the concept of “Quiet Time” - Self Introspection. The inner voice speaks thoughts in the purest form. Listening to these thoughts and acting upon them helps every individual remain focussed and lead a life of satisfaction. When practiced daily, one must evaluate one’s self on the basis of the four absolutes of Purity, Honesty, Unselfishness and Love. When derailed, one must take corrective measures, apologise and get things back on track. Following disciplined Quiet Time helps discover those feelings that a person has not experienced before. Most of us live our lives on retrospection. It is said life is lived forward and understood backward. Doing Quiet Time regularly provides an alternative. We can live our lives on introspection rather than retrospection. The participants experiencing Quiet Time in their respective groups. Career is very important in every individual’s life. Career and Education build the foundation of our life. The stronger and deeper the foundation, taller will be the multi-storey building of life. Through the Golf Ball Exercise, the participants were explained the importance of Career, Family relations, Hobbies, Wealth Creation and Health. Through various life experiences, each of these goals was explained in depth. The students were explained that in order to achieve any long term goal, that long term goal had to be broken into short term goals. Then, these short term goals have to be converted into a daily action plan. It is only through daily effort and hard work that these short term goals can be achieved. In order for the daily efforts to be sustained, daily connection with one’s inner self is very important. With this, the participants were given time to introspect, design the road map of their lives and pen down ways on how they plan to achieve every goal they have set for themselves. The students wrote a lot. One student shared, how much for granted she had been taking her studies. She vowed to focus better in class and do well in her exams. Another girl shared how she was inspired by the exercise to do her Masters. Today, vices, such as drinking, smoking, gambling are very accessible. It is very easy to succumb and become addicted. Everyone needs to make a conscious effort and choice toward a higher standard of living, without these vices. Family is very important in our lives. Whatever we go through during the day, at the end of the day, we go back to our family. Today’s youth tends to take family for granted. We must not run away from relations but hug them and develop them. Each one of us somewhere has a broken relation in our lives. One must introspect and take corrective measures to mend this relationship, because when one does so, the burden from within evaporates. One feels much lighter and with the new mended relation. It is only due to ego that one fails to take the first step towards extending that olive branch. Through self introspection, we must look at the bigger picture, remind ourselves of the importance of family, place our ego aside and take corrective steps. Mr. Viral Mazumdar shared how he had a broken relationship with a very close friend. How this broken relation remained for years together and how, by listening to his inner voice and keeping aside that ego, he took the first step of calling up his friend and mending his relationship with him. One girl said that her mother was not keeping well since a long time. Even though living in the same house, she always ignored her mother. She realised her mistake and decided that she will be more caring and loving towards her. One girl spoke of her indifferences with her cousin brother due to the complications in her family. She realised her mistake and decided to be a good sister to him and decided not to make the same mistakes made by the elder generation. Another young lady shared that she was married at a very young age against her wishes. She said that she held this against her parents. As a result, post marriage, she didn’t keep in touch with them. However, after the family session, she realised that she was being too harsh with her parents. She said that if she saw things from her parents’ point of view, she would see a different picture. She decided to reconnect and mend the broken relation with her parents. A girl shared how she had recently lost her father and was finding it very hard to cope with the loss. Another girl shared how she had never been given much love from her parents since she was a girl. This created a barrier between her and her father. She resolved to make an effort to bridge the gap with her father. Another young lady shared how she used to lie to her parents in order to go meet her friends. She said that she would stop doing it from now on. The last day of the conference, started early with a Multi-Faith prayer with everyone participating and reciting the prayers of their respective faiths. It was closely followed by a presentation regarding the role of the mind viz. the conscience and the ego. The mind has a choice to either side with the ego or to side with the conscience. Very often, we face a situation in life where despite knowing the right thing to do, we still end up doing the wrong thing. This is because the mind decides to align itself with the ego rather than the conscience. Usually the path shown by the conscience is an uphill task requiring time and efforts. The mind prefers taking the easy way out and siding with the ego. The only way to overcome this is through regular quiet time. This strengthens the conscience. Slowly, the inner voice becomes louder and louder. Eventually, the mind sides with the conscience. Thereafter, the decisions in our life are governed by the conscience, leading to a much better life. Group photo with the coordinating team. Another concept touched upon was that of sustainable living. We live in a world of exhaustible resources although we treat it like a world of inexhaustible resources. We live in blissful ignorance of the stark reality of the situation. If each one of us makes a conscious effort to moderate our use of paper, electricity, water and fossil fuels, then it can truly make a difference. Global change through personal change. The Conference concluded with a vote of thanks. During this session, the participants presented each member of the coordinating team with flower and a chocolate as a token of their appreciation. During this session, the vice-principal of the college, Mrs. Poonam Singh said that in her 30 years with the college, she has never seen such a transformation in the girls. She said that the college has organised several academic seminars, but none were as relevant and appropriate as the Lmad, Mumbai Youth Conference. She also expressed commitment on behalf of the college to the cause of Lmad, IofC. She expressed her gratitude to organiser, Saurabh Sanganee, who made several trips to and from S.N.D.T. College and worked very sincerely to ensure that the conference went smoothly. A young lady shared how she had to fight with her family to get permission to attend the conference and how she had to break her piggy bank in order to pay the conference fees. Tearfully, she thanked the entire coordinating team and said that no one would benefit from the conference as much as she has. She said she would apply the teachings from the conference not only in her husband’s family but also in her parents’ family. The Multi-Faith Prayer on the morning of 29 January, 2013. One girl thanked the entire coordinating team for the conference. She was in her last year of studies. She felt she had learned so much from the conference, however being in her last year of studies, she felt that if had she received these inputs earlier on, then she would have been a completely different person today. So, she shared that she would like to take responsibility to spread this learning among those students who are just entering college life. 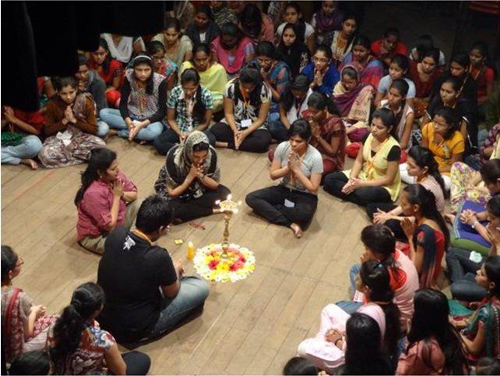 The conference was organised by Saurabh Sanganee, Ariha Doshi and Dipti Rane. The coordinators were Nikhil Ranjan, Sachin Agrawal, Alifiya Patta, Nisreen Baramatiwala, Aswini Mohapatra, Aakash Mehta, Neda Hussaini, Bhisham Mansukhani, Sneha Agrawal and Abhishek Malhotra.